This article explains how to redeem your Avios points on Aer Lingus. One of the biggest issues with redeeming Avios for long-haul flights is the level of taxes and surcharges imposed by British Airways. These usually run to around £550 per person in Club World (£650 to North America) and £275 in Economy, return. For Club World, I can live with this – after all, I would be paying a lot more for a cash ticket. For Economy seats it often makes your Avios close to worthless. British Airways Executive Club has two partners who offer long-haul flights from Europe without excessive surcharges. I have looked at Iberia already. In this article we will look at Aer Lingus. Aer Lingus is a sister company to British Airways since it was bought by IAG, BA’s parent company, a few years ago. Following substantial investment, it has an impressive long-haul operation focused exclusively on the United States and Canada. New seats and new aircraft means that it has a Business Class product which is, frankly, superior to British Airways Club World in many respects. We reviewed the Aer Lingus Business Class service between Dublin and Boston in Business Class 18 months ago. The flight and seat is reviewed in that article and others in the series cover the Aer Lingus lounges in Heathrow, Dublin and Boston and the pre-clearance lounge (once you’ve cleared US immigration) in Dublin. What routes can be booked with Avios? There are also services from Shannon to New York and Boston. The planned Montreal route has been postponed until 2020 due to delays with receiving new long-haul aircraft. It used to be the case that Aer Lingus seats could only be booked with Avios via a telephone call to British Airways Executive Club, with no way of checking availability online. This changed in December 2016 when Aer Lingus reward availability was loaded into avios.com. Option 1 is to use avios.com. You can book online and you get the widest choice of dates. You will pay around £200 in taxes and charges for a long-haul business class flight from Dublin to North America. Option 2 is to use ba.com. You cannot book online, only by telephone. Anecdotally, there is less availability than you see via avios.com, and you cannot check availability online before you ring. However, you will only pay around £75 in taxes and charges for a long-haul flight from Dublin to North America. You can still access avios.com if your Avios Travel Rewards Programme account has been closed by opening an Aer Lingus AerClub account here. For clarity …. if you book UK – Dublin – North America on the same ticket then you will also need to pay long-haul premium cabin UK Air Passenger Duty. Booking two separate tickets dramatically reduces the taxes although you must build in enough flexibility to ensure you don’t miss your connection. Can you use a BA American Express 2-4-1 voucher on Aer Lingus? No. You cannot use a 2-4-1 voucher on Aer Lingus or any partner airline. You CAN use ‘cash and Avios’ to replace some Avios with a cash payment if you do not have all of the points you need for your redemption. 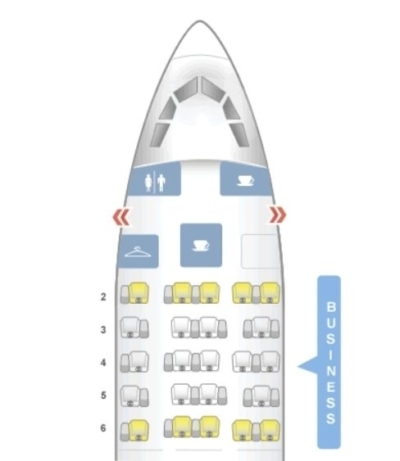 The cost per Avios varies depending on your class of travel and how many Avios you are short. How many Avios will I need? However, Aer Lingus has been rather sneaky. Dublin / Shannon to Boston SHOULD be in Zone 4. It used to cost 75,000 Avios for a return business class flight from Dublin to Boston – which is what you expect to pay for a partner airline flight of 2,986 miles which is how long the Dublin flight is. Aer Lingus has now moved Boston 14 miles to the west. 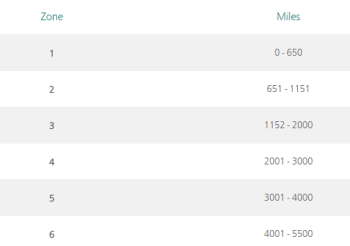 Dublin to Boston (and Shannon to Boston) have been moved into Zone 5 which means it now costs 100,000 Avios off-peak and 120,000 Avios peak – the same price as Dublin to New York. 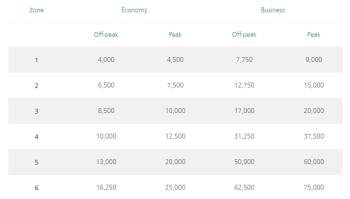 Aer Lingus has its own peak and off-peak pricing. The list of peak dates does NOT match the British Airways list of peak dates. For comparison, the British Airways and Iberia 2019 calendars are here. On a long haul flight the saving in Avios would be attractive. 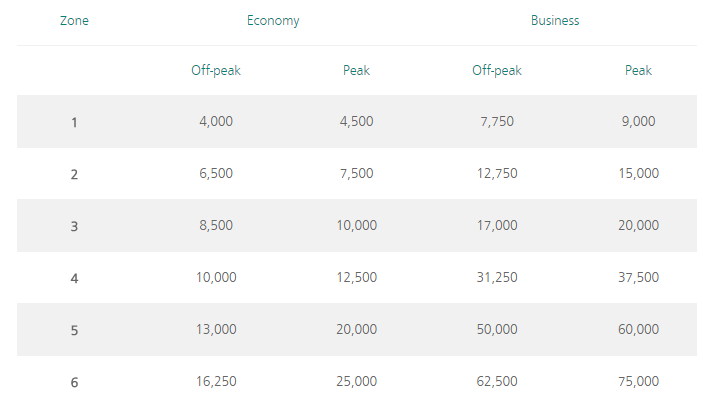 It makes the Aer Lingus long haul services from Dublin to North America worth considering during weeks where BA is charging peak prices and Aer Lingus is not. Just to be clear the Aer Lingus peak and off-peak dates apply to Aer Lingus flights wherever you book them. If you book an Aer Lingus flight on ba.com then it goes by the Aer Lingus calendar and not the BA calendar. What do I pay in taxes on Aer Lingus? 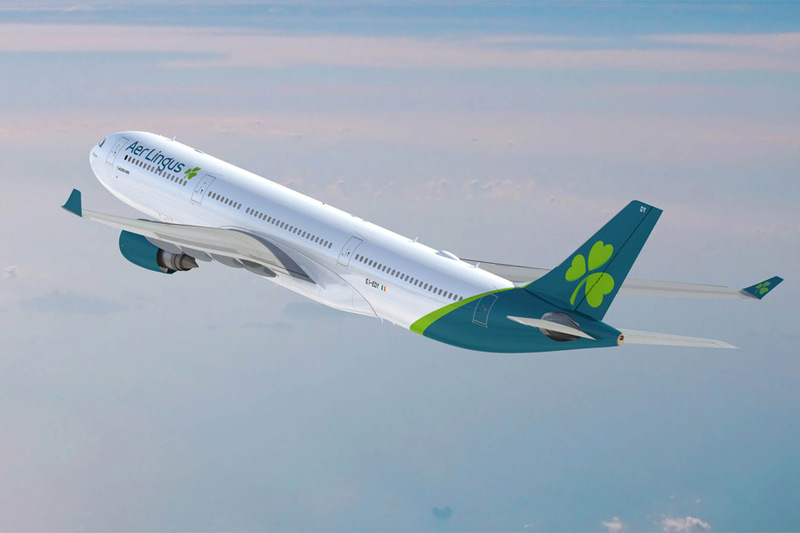 Taxes are very low when redeeming Avios for Aer Lingus long-haul flights. Avios has still found a way to make it confusing, however. As I mentioned above, there are now TWO ways of booking a redemption on Aer Lingus. Book via avios.com and you will pay around £200 return for a Business Class return. Book via British Airways Executive Club (on the telephone) and you will pay around £75 return. Remember that these tax figures assume you start your trip from Dublin. If you add in a connection from the UK on the same booking then you will be hit for long-haul Air Passenger Duty of over £100. You would need to buy or redeem for a separate connecting ticket to Dublin. However, when you are on separate tickets, Aer Lingus has no liability to you if you miss your connecting flight due to the late arrival of your incoming flight. You may therefore need to travel to Dublin a day earlier, or give yourself a long connection time in Dublin. You need to factor all this in when considering whether this is a better deal or whether you should swallow the APD and book UK – Dublin – North America on the same ticket to guarantee you are protected if you miss the connection. How do I check Aer Lingus Avios availability? The obvious thing to do – given that taxes are lower if you book via British Airways Executive Club via telephone – is to book that way. You can check availability at avios.com online first before calling British Airways. However …. anecdotal evidence suggests that avios.com has better availability than ba.com. Since the Avios Travel Rewards Programme was closed, you may no longer be able to log in to avios.com. If this is the case, open an Aer Lingus AerClub account via this page and then log in at avios.com using those details.. It is possible that you can see a seat available for booking via the Avios website which British Airways cannot see. If this is the case, you should try calling BA back. You may simply have had an agent who doesn’t understand how to find Aer Lingus flights. If a second agent cannot find the flight, you need to decide whether to change your dates or book via avios.com and pay the higher taxes. These taxes are still a lot cheaper than booking on British Airways from London. Coming back to the UK, you CAN book your connecting flight in one ticket. It makes no difference as there is no Air Passenger Duty on flights TO the UK. Moving your Avios around between Aer Club at avios.com and British Airways Executive Club is free and instantaneous via ‘Combine My Avios‘ on avios.com. If you are heading to Toronto or the USA, Aer Lingus offers you a great way of saving a substantial amount of money in taxes and charges – around £250 per person in Economy and around £400 per person saved in Business compared to a British Airways redemption! Even if you want to have your connecting journey from the UK to Dublin on the same ticket, to avoid any risk of misconnecting, you will still save between £100 and £250 after adjusting for Air Passenger Duty and get an arguably better Business Class experience than British Airways offers. Very attractive for people living in South Wales, as it’s a rare opportunity to utilise avios groom Cardiff, I believe. Agreed. I’ve done this. You can get a flight from CWL to DUB for around £60 return but have to pay extra for luggage both ways. In addition there aren’t too many flights in the morning from DUB to CWL so upon return from the US to DUB there can be a long wait to get a flight to CWL. Yes, been dropped I believe. Bear in mind you can book Flybe with Avios for another month. I’m still able to collect miles via the avios website. Are some not able to? Avios.com accounts have closed. Avios.com as a hosting website for Aer Lingus, Veuling will continue. Now i’m even more confused…. My avios.com account is definitely still open, unless it’s just a Aer Lingus website, with Avios front end? Likewise for me, I still see the Avios shopping offers like before. I’d opened and linked an Aer Club account to Avios previous to Avios ‘closing’. Go to the My Account bit, at the bottom you should see an Aer Lingus, Vueling or Flybe logo. A lot of the confusion is because people keep taking about Avios.com closing or Avios.com accounts closing. Avios.com never was closing and there never was an Avios.com account. All Avios Travel Rewards Programme accounts (once accessed via Avios.com) have now been closed and all of the Avios transferred to your BAEC account, unless you were also a member of AerClub, Vueling or Flybe as Rob states. If the latter applies, your Avios stayed in your AerClub, Vueling or Flybe accout, still accessible via Avios.com. The Avios.com website still allows the same functionality as it did, you just can’t now see your Avios Travel Rewards Programme account as it’s no more, and I’m guessing anyone with a FlyBe one will see that go shortly too. How are the avios and tax components worked out if you add the connection onto the return? Eg dub-jfk then jfk-dub-Lhr all on one ticket? I’m struggling the find the correct number to call BA/Avios, having been given the run around yesterday when I eventually gave up as No Reply ? I called 0800 727 800 to book. VERY slow process, can take 45 minutes to book. Last year I looked for business availability DUB-NYC and basically found none. Is there a trick to finding it? Agree it is very scarce. Other routes seem ok.
Only 2 J seats are released per flight. Not split across the group ? for JFK-DUB-LON, why does avios.com give the price as 17k avios off-peak? is the redemption priced as the sum of two individual sectors? Can you use a Lloyds upgrade ticket with Aer Lingus through your Avios account? Also will I see my upgrade voucher if I create an Aer Lingus account as my Avios account has now been closed? i don’t see that clearing immigration in Ireland helps much anymore. The last time I flew to JFK almost everyone (US or non US citizens) used a self service kiosk to scan their passport, we were then directed to two queues. Holding a UK passport with ESTA I was in the same queue as US citizens. So no time saved at all. The same happened at DFW – everyone uses the kiosk, US citizen or not. Everyone then hands their receipt to an official, US citizen or not. OT but to note that Google now damaged matrix.itasoftware.com tool. Multiple Departures search was disabled last year, I believe. But now I find more and more that search results less inaccurate, compared to online aggregators/Expedia and airline own websites. It definitely stopped searching ALL fares with stops and gives a cursory view. I usually find it only beneficial when say its an open jaw offer and you force it to search airline and stops, seems to work best. Another fav is being able to force search a 23 hour stopover especially when I want to get off at Heathrow and miss (next days flight). Yes, its a fantastic tool still albeit a bit slower now you have to search by each countries airports. I don’t understand why taxes vary so much on Aer Lingus redemptions between Avios.com and calling BAEC.